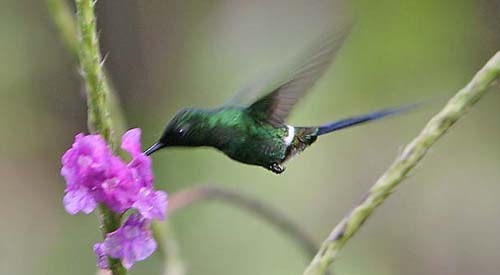 Costa Rica is loaded with hummingbirds. 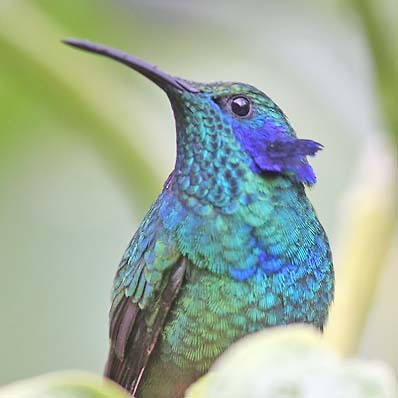 The country's checklist boasts 51 species. 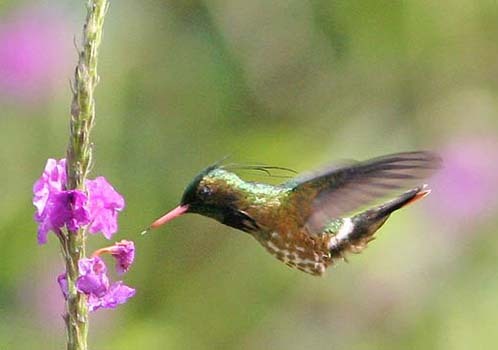 These range from widespread and common, like Rufous-tailed Hummingbird (above), to rather scarce and local ones, such as Black-crested Coquette (right; coquettes are among the tiniest birds in the world). During a brief two-week visit in Dec 2007, we managed 28 of them (and I'd seen two more in 1989). 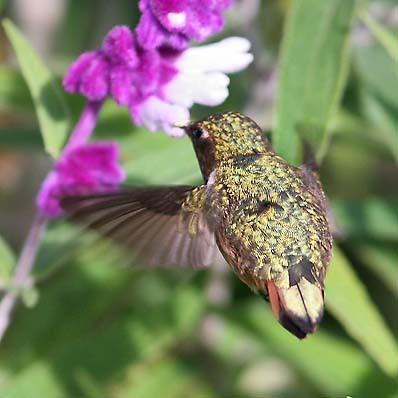 This gallery shows 18 species from visits to 6 sites. 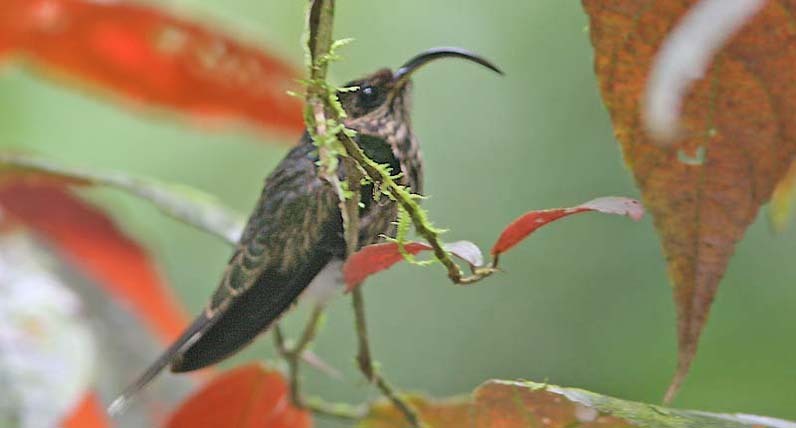 Perhaps my favorite hummingbird experience was the search for the bizarre White-tipped Sicklebill on the Osa Peninsula. This is a scarce and local foothill species found from Costa Rica to northern Peru, and until this trip it had eluded me. Guided by Abram from Bosque del Rio Tigre lodge on the day after Christmas, we waded up the narrow canyon of the Rio Pizote late in the afternoon. 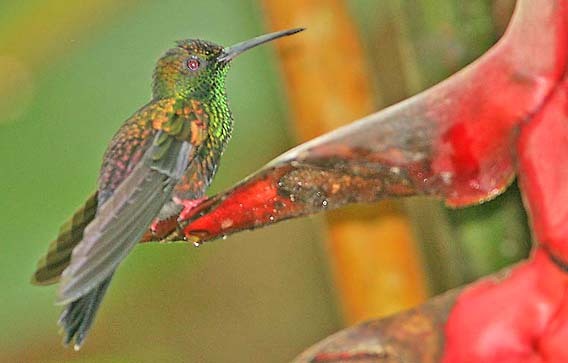 There was very little bird activity this late in the day, and nothing was at the Heliconia flowers favored by this species. The steep walls of the canyon, cloaked in thick ferns, made in feel unworldly. Then Abram spotted the sicklebill on its night roost, on a branch overhanging the river, and I was able to approach at close range. It was so dark that flash photos seemed the only hope (left) but I did manage one handheld shot at very slow shutter speed (below) that I like much better. 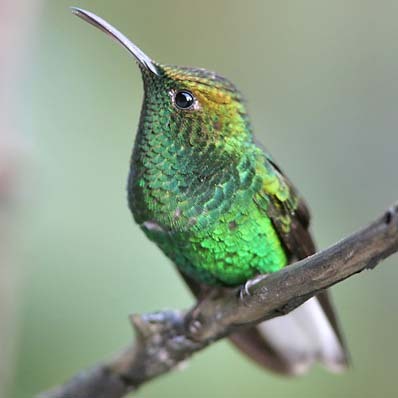 Five species of hermits forage in Costa Rican woodlands, if we include Band-tailed Barbthroat (which we saw but did not photograph) as a hermit. 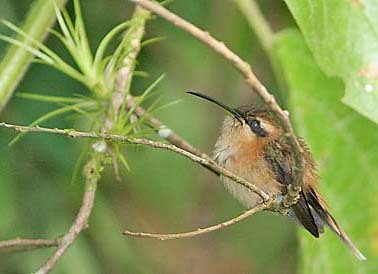 These tend to be lowland forest species, but some reach middle elevations (2000 m = 6500'), like Green Hermit (below left). 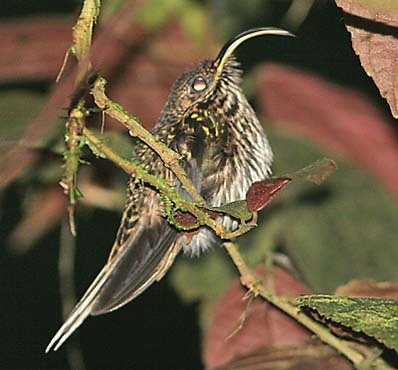 The smallest is Stripe-throated Hermit (below right), found in both Atlantic and Pacific lowlands, which is a recent split from Little Hermit of South America. 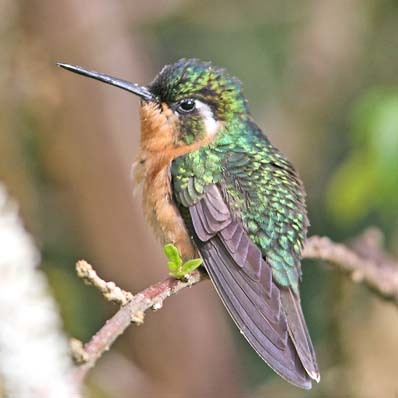 One very fine spot to observe mid-elevation hummingbirds is Mirador Cinchona, at ~1200m elevation (4000') on the slopes of Volcan Poas. 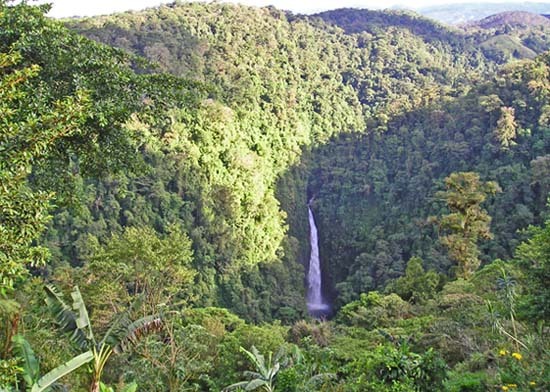 This is the home of Guillermo Herrera, who provides guide services throughout Costa Rica, and has an incredible waterfall view (right). 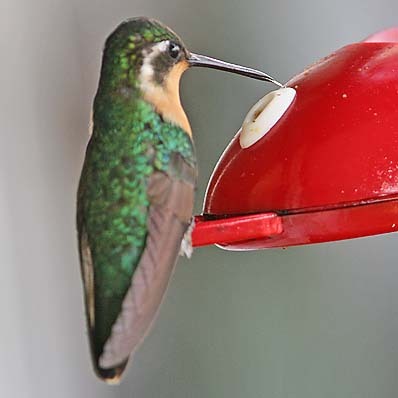 There are feeders that attract tanagers & toucanets, and there are hummingbird feeders. 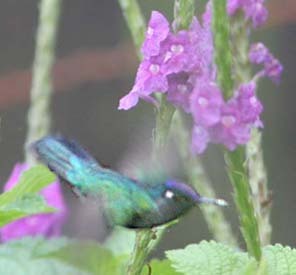 Species observed during our short visit on 19 Dec 2007 included Green Hermit (photo above) and those shown below. 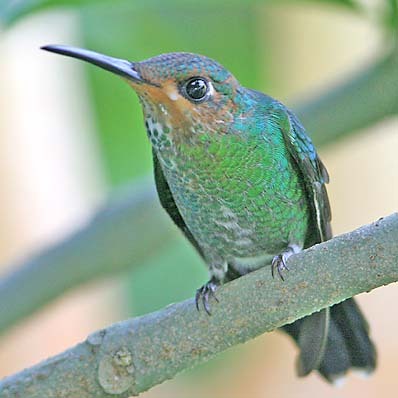 Among the common species is Coppery-headed Emerald; this is a Costa Rican endemic and is featured with more photos on a page on endemics. Higher in the mountains, and farther south, is Cerro de la Muerte (the peak is 1351m = 11,322'), where in a side valley Savegre Mountain Lodge, known for its quetzals, sits at 2200m (7200') elevation. 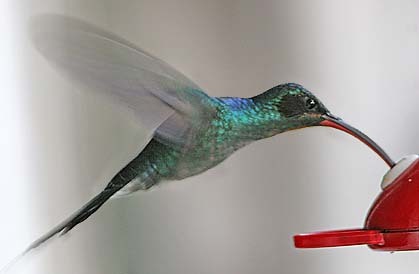 Hummingbird feeders are also a big attraction here. 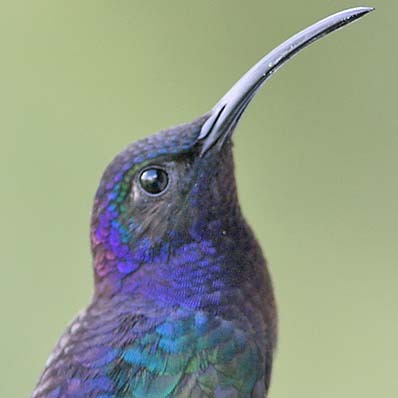 A specialty is White-throated Mountain-Gem (male, below). 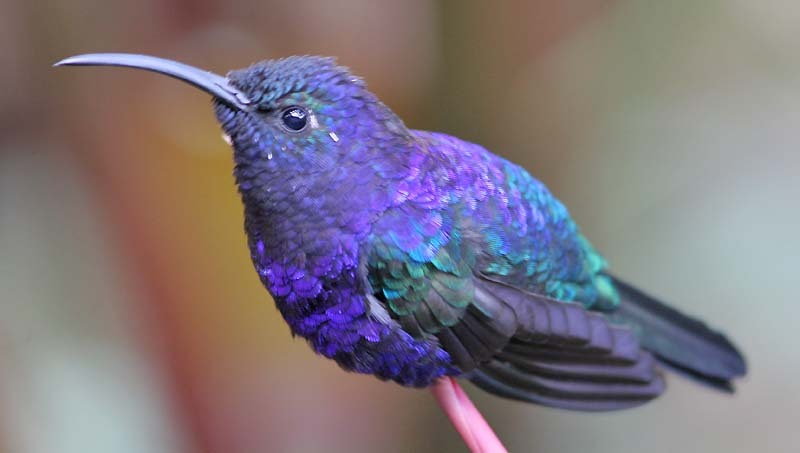 The female (below left of the photo of the male) is virtually identical to female Purple-throated Mountain-Gem. Other hummers present there in late Dec 2007 are also featured below. 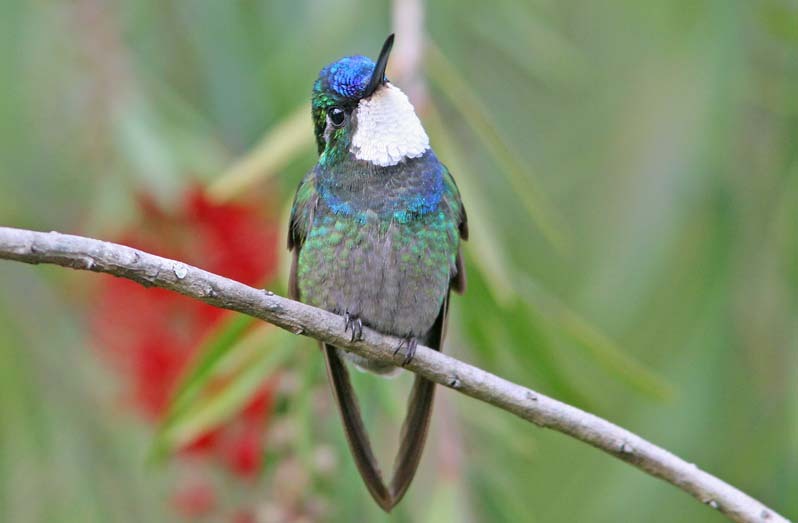 and higher up in the cloud forest, where the Pan-American Highway crosses the highest ridge on Cerro de la Muerte, Fiery-throated Hummingbird (right) may be found. 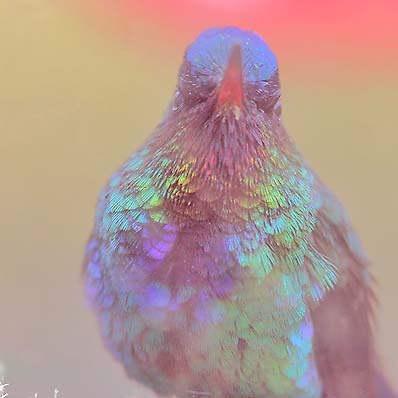 This male was photographed through the grimy windows of 'Georgina's Restaurant' at about 3300m (10,000'). 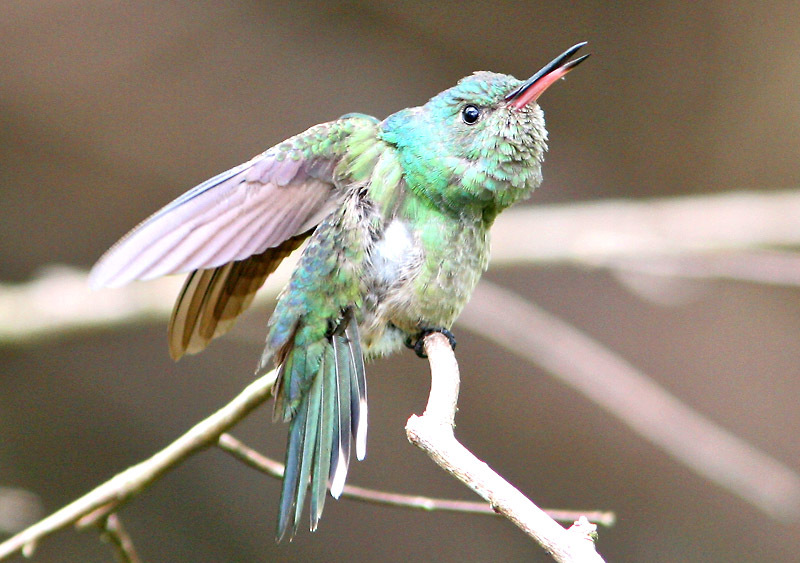 Our final species was a male in display along the Rio Rincon on the Osa Peninsula. 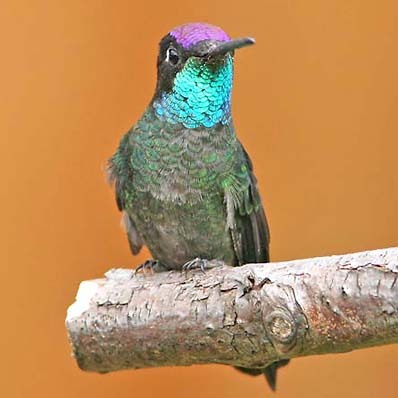 This is the Scaly-breasted Hummingbird (below).